November 3rd morning, at an intersection between Tiexi Road and Shifu Road in Hunan Zhuzhou, some people in a van tossed a bit of garbage on the ground after eating breakfast. A sanitation worker approached them and asked them to pick it up and they got into a quarrel. Afterward, the sanitation worker pulled open the car door and chopped off the woman in the car Zhou Ting’s middle finger. November 3rd morning, the incident happened at an intersection between Tiexi Road and Shifu Road in Hunan Zhuzhou when Zhou Ting, her husband, and friends were sitting in the van for delivering goods. Suddenly, someone pulled open the front-passenger seat door attacking Zhou Ting’s husband with a knife. 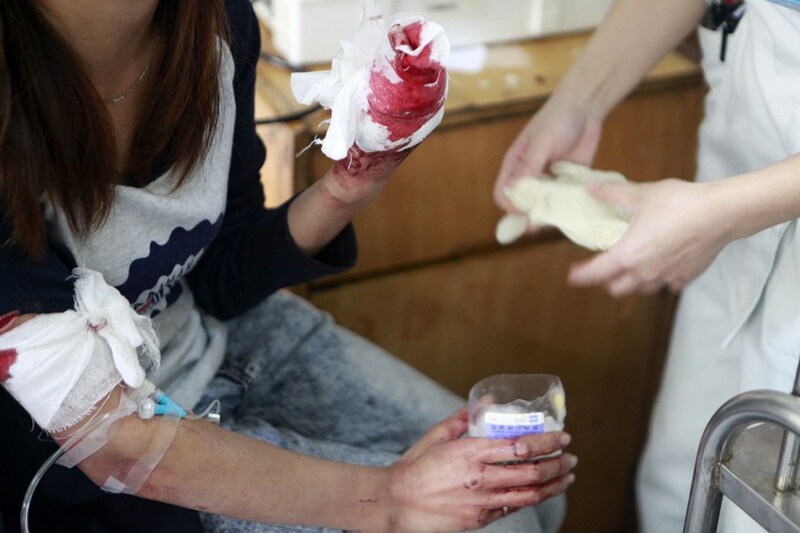 She threw herself to protect her husband’s chest without thinking and as a result, her fingers were cut with a section of her left middle finger cut off and her right arm wouldn’t stop bleeding while her husband’s arm and hip were also cut. 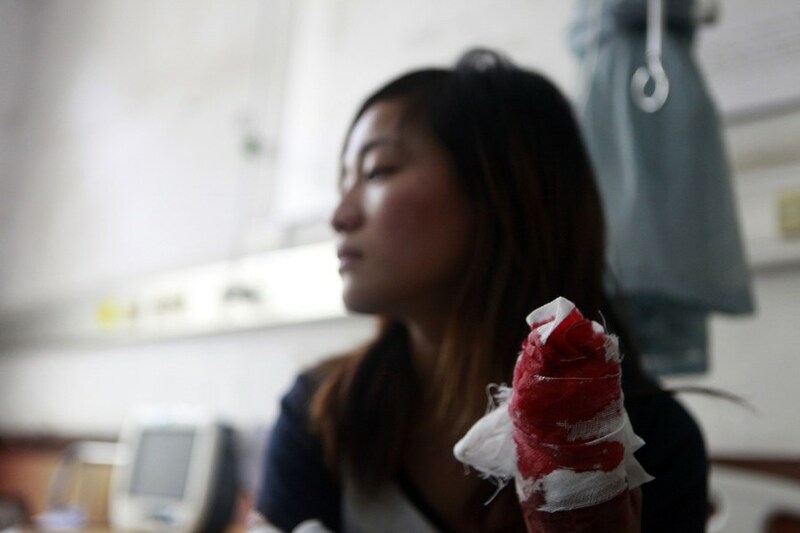 This picture [above] is of the 22-year-old Zhuzhou woman Zhou Ting’s hand with her middle finger cut off. According to eyewitness Ms. Wu, the people in the van tossed a bit of garbage on the street after finishing their breakfast and the sanitation worker approached them and asked them to pick it up. According to another man who was purchasing goods nearby, it seemed both sides were arguing. Before anyone could react, the sanitation worker began attacking with a knife. The picture is of the scene of the incident where a city resident who witnessed the incident is getting an interviewed by the media. After the attack, the sanitation worker put the now-deformed kitchen knife behind his back, then picked up his broom and went on sweeping the streets. When 110 arrived, he even climbed onto the rooftop of a 14-storey building nearby, but was persuaded to come down afterwards. 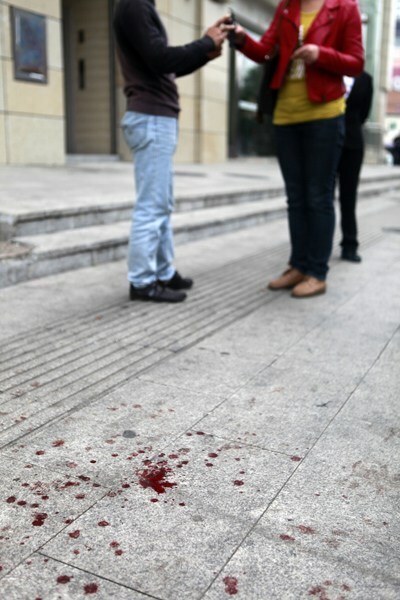 This picture is of the scene of the incident, the street splattered with blood. 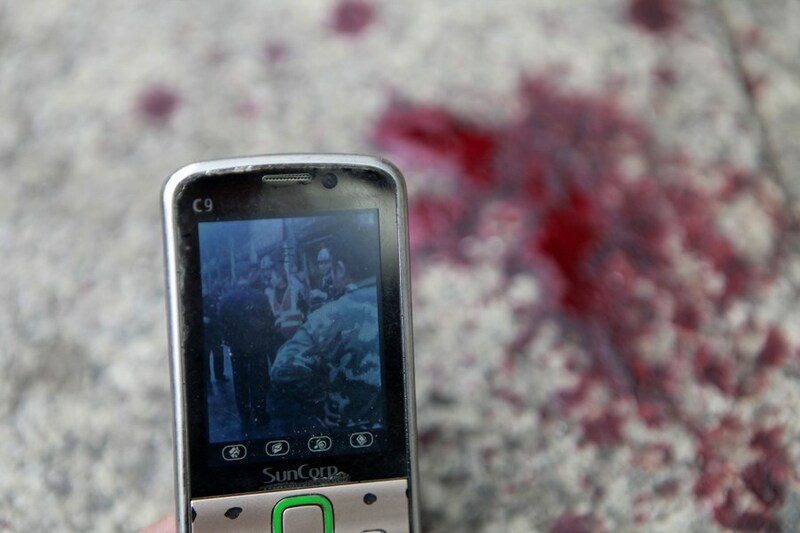 November 3rd, Hunan Zhuzhou, a city resident who witnessed the incident used a mobile phone to record the moment when the sanitation worker was taken away by the police. 22-year-old Zhuzhou woman Zhou Ting’s middle finger has been cut off. 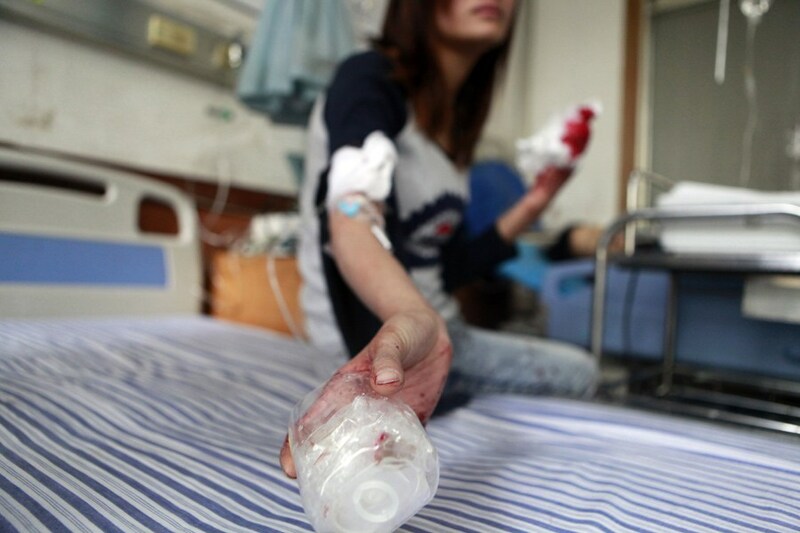 The 22-year-old Zhuzhou woman at the hospital receiving medical treatment. 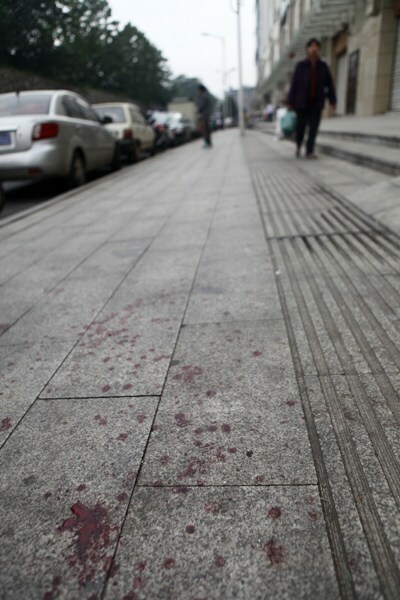 The attacker is named Guo Nengfang, 33 years old, from Yuanjiang who has only been doing this job for 20-some days, and previously made his living “wandering around”. Guo Nengfang’s state of mind is still unsettled. This picture is of over two hours later, at the Zhuzhou Lusong District Jianning Police Station, where the attacking sanitation worker is cuffed to an armchair. A lesson learned in blood! If you don’t show understanding for other people’s hard work, they’ll let you have a taste of barbaric violence! Littering is admittedly a problem of morality and character. But “first floor” [the above commenter], you supporting the sanitation worker’s actions like this, isn’t that a little too extreme? According to [your] logic, those people who cross the street during a red light in the future should also be given a lesson in blood? According to [your] logic, for the customer who enter a store and is slightly rude and unreasonable in the future, the salesperson should also give him a lesson in blood? According to [your] logic, if your kid has a conflict with classmate in the future, and your kid is in the right, you’ll also go give your kid’s classmate a lesson in blood? This matter has nothing to do with the sanitation worker’s hard work. Them littering is admittedly wrong, but it’s not deserving of having their fingers cut off. Moreover, they only broke the rules/regulations, not even the law! The sanitation worker acted in reasonable self-defense. The one cut off was the most useful. The sanitation worker cutting off her finger was so wrong, how can you cut off someone’s finger? With people like this who litter and still refuse to pick their trash up after being reminded, you should cut off her hand. The tossed “a bit” of garbage is the highlight. [She] indeed should improve her character and respect other people. Sanitation workers have always been the group of people I respect the most in my heart… because they serve the people through hard labor, the wages they receive being very low, their job being the dirtiest and the toughest and are not respected by other people. If one street in a city were to be short one of its sanitation workers, then this street would become overwhelmingly foul, so we can’t live a day without them. They start working in the middle of the night. Especially in the coldest winter when we’re in our warm beds, they’ve already begun to work in the chilling wind. In summer under the scorching sun, they still work. They get minimum wage, why? Because our government didn’t give them the respect and treatment they deserve. They serve us for real, unlike many governmental departments that only hang slogans on their doors/buildings for people to see… This time, this is a rookie sanitation worker, he shouldn’t have attacked people with a knife, he indeed was wrong, but he’s just a individual case, so the image of sanitation workers will never change in my heart, and I forever respect you, the loveliest people of all… A netizen of Zhejiang Ningbo Ninghai–小叶. In the future, we should promote sanitation workers bringing knives to work, and our countrymen’s characters will definitely be higher after a year. I don’t feel sympathy for the littering woman, but instead sympathize with the sanitation worker. In China’s current national conditions, I must say using this kind of extreme method to solve problems is a tragedy. Many people do have low characters. For this kind of people who don’t know how to appreciate other people’s work, relying only on lecturing/education is of little use! This cut might be the best lesson for this kind of people! Support! Well-cut/chopped! Many people in China are without character like this, thinking they can do anything they want just because they have money! Not thinking about other people, not respecting other people. The sanitation worker overreacted, but some people don’t respect other people’s work at all, and some individuals even ruin/wreck [other people’s work] deliberately, just for fun. People like this should be taught a lesson, too loathsome! It’s always been the sanitation workers who get beat/attacked, today one of them strikes back. Sigh, that’s why people say, one should be conscientious of their behavior! Why chop the hand? Because this pair of hands had done something wrong! The chopping was justified!! Punish one to warn the rest!! Good, people who litter are as annoying as garbage itself! Peter is a born and raised Chengdunese who enjoys drinking with all his friends. 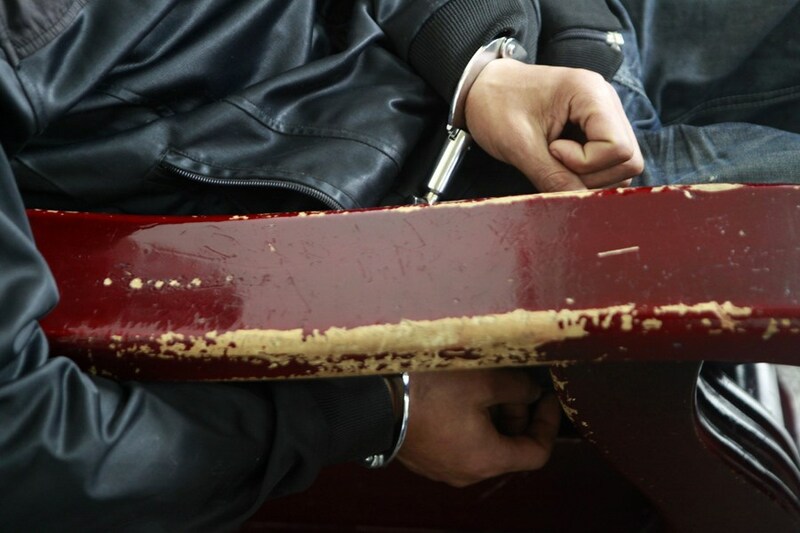 Beijing Foreigner Extorted After Running Into Chinese Woman?